If Didier Drogba was a suitcase, he would be the Samsonite F’Lite GT Upright Spinner. 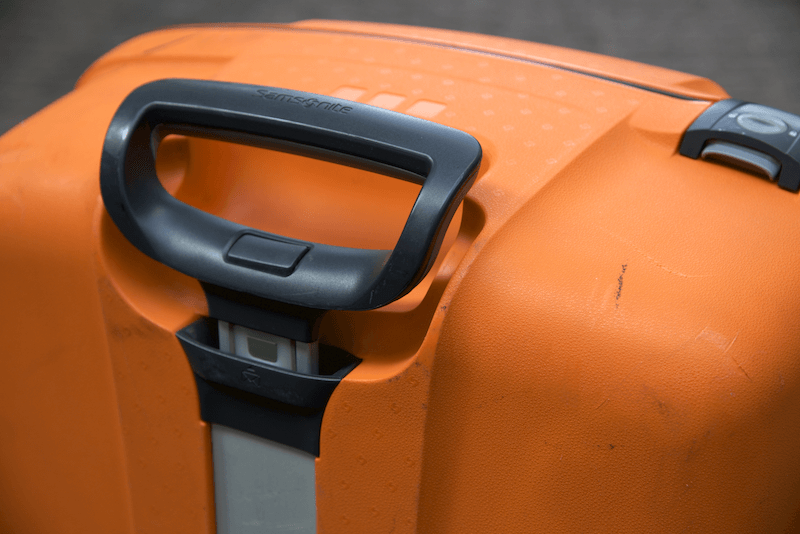 This high-vis orange monster of a suitcase is made almost completely of polypropylene and can comfortably hold everything you’ll need for the rest of your life your next trip. To clarify right away, no this does not meet carry on requirements. This hardshell is downright intimidating. At first glance, you’ll notice that there aren’t any zippers on this suitcase and that there aren’t any external pockets either. It’s simply one solid orange vault. The F’Lite spinner weights 11.3 pounds according to my David’s Been Here Travel Scale. 11.3 pounds isn’t too heavy since the luggage is 31 inches high and 21 inches wide,but it isn’t that light either. Considering it’s size, the Samsonite F’Lite’s ability to nimbly twist and turn is almost as impressive as the meteoric rise of spinner wheeled suitcases since Samsonite invented them in 2004. 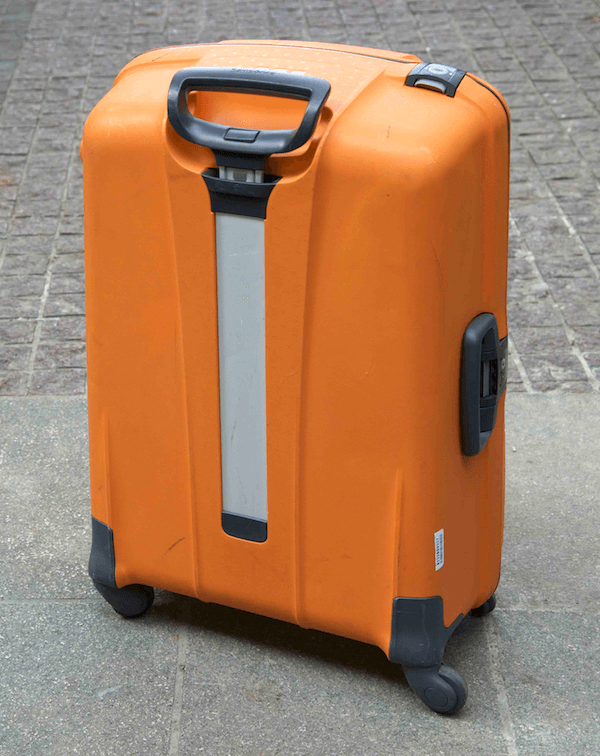 The 4 spinner wheels of this luggage is one of the major plusses since it allows it to move around with ease even if it’s full of clothes or gear. The interior of the Samsonite F’Lite is generally standard. The interior is not lined, however it does contain some straps for keeping your clothes or gear in place. The top side of the suitcase has a large zippered compartment and there is also a small sack for holding accessories or undergarments. Since the Samsonite F’Lite is a hardshell, it won’t easily absorb water like a suitcase made of fabric would. Water rolls off of the polypropylene exterior, however the luggage is not completely waterproof, since water could seep in from the clasped closure. We’ve checked in the Samsonite F’Lite several times on flights in South America, Asia and more, and the suitcase seems to be holding up very well. There aren’t any dents or major breaks in the luggage. The hard exterior also seems to protect the gear kept inside the suitcase as well. I’ll update this post if I ever run into any problems with the bag. The luggage also includes a TSA approved combination lock which is build into the closing mechanism. This is extremely useful since you won’t have to deal with losing the lock. One of my favorite parts about this luggage is it’s spinner wheels. 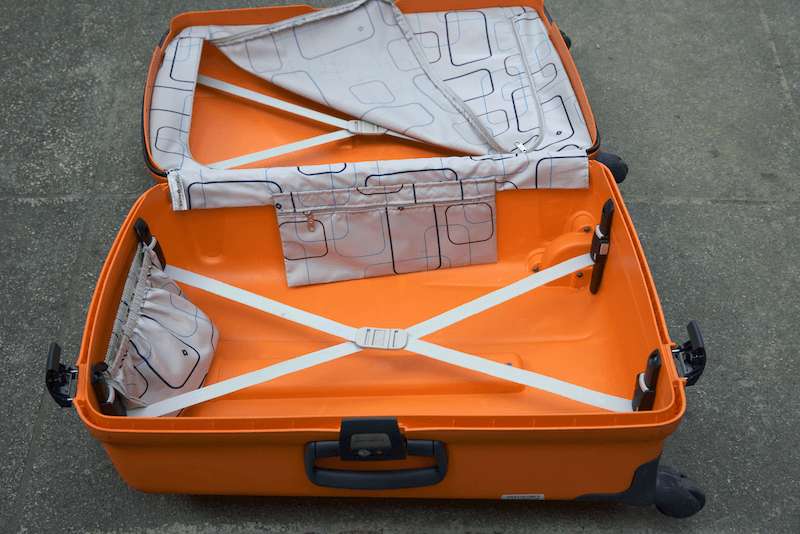 The four wheels can turn in any direction, allowing the suitcase to be pushed without much effort. In addition, the handles are well placed so that the bag can be easily lifted or pushed. The hardshell of the Samsonite F’Lite is both a benefit and problem. Unlike with soft sided fabric suitcases, scratches on hardshell luggage tend to show up easily. After being thrown around by luggage carriers in the airport, my Samsonite F’Light now has some vicious looking scratches and the occasional marks. If you are planning on getting this suitcase, expect for it to take a beating while checked in. I’d recommend getting a set of packing cubes if you’re planning on getting this bag, since it doesn’t have much internal organization. The interior of the luggage has nothing but a few straps and a zippered compartment, so you may want to get packing cubes to keep your clothes organized and in place while flying or on vacation. Since there are not outer pockets on this luggage, it can be annoying when trying to quickly access items from the luggage. It would be helpful if Samsonite added a small pocket possibly on the exterior of the luggage so that small items like papers or tickets could be accessed without having to open up the main compartment. I have read some reviews about this suitcase having durability issues with it’s wheels, however I haven’t run into any problems. The wheels on my luggage are completely intact and feel solid. The Samsonite F’Lite is one of my favorite hardshells, due to its spinner mobility and durability. The weight of this luggage is reasonable and it also has a large capacity for travelers who need to bring lots of gear. The only major downside to this luggage is that it can be easily scratched. Do you have any questions or comments about this luggage? Leave your comment below. The Length plus Width plus Depth of this suitcase is more than the 62″ allowed by Delta, American Airlines, and probably many other airlines, which could mean being charged a hefty fee by the airline. The dimensions of this suitcase according to Amazon.com are 31 x 21 x 12 inches, which totals to 64 inches. 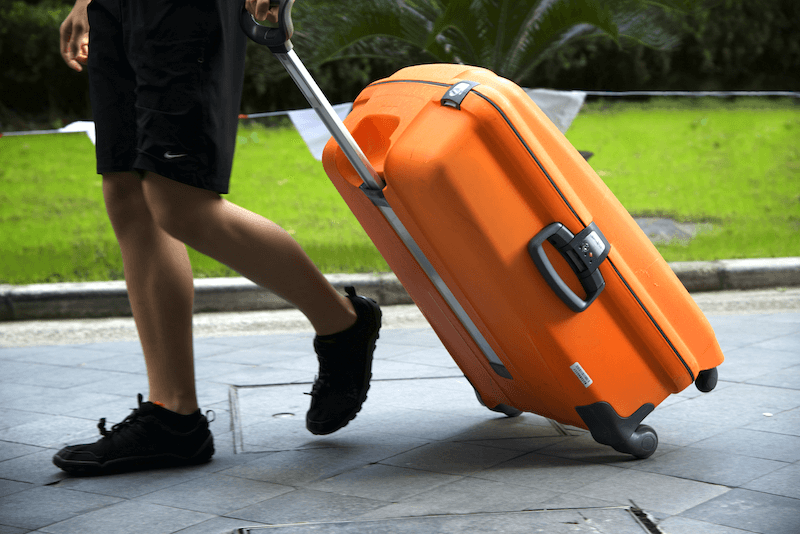 However, it’s important to recognise that the suitcase flares out a bit making the bottom of the suitcase wider than the top (this helps to make the luggage more balanced). The dimensions depend on which part of the bag you measure. We have checked this luggage in several times with several different airlines without any issues. Love the bright orange color! Can the zippered compartment on the top side of the suitcase be removed? Is it held on by velcro or something? I’m not sure exactly what zippered compartment you’re referring to. Are you referring to the zippered panel which separates the two sides of the main compartment? That’s can’t be removed. It’s attached to the suitcase. You could just unzip it completely (but it’s still attached to the suitcase, kind of like opening a door, it’s open but still hinged to the wall) and then you’d have one large main compartment for holding bulky items. So how is it holding up now? Any troubles with oversize bag fees? Any troubles with the locks or handles? These have been out of production for a while now, and yet you see them on amazon and other ‘markets’. Do you think those are fakes? They do seem to have a lot of problems. Hi Samir – honestly, I’m not sure about those, I don’t think they’re fakes, but I haven’t tested them out. My F’lite is still holding up, although I don’t travel with it all the time (I usually rotate out my check-in suitcases).